Our natural soaps are made right here on the farm. Why do we make natural soaps? Store bought soaps with chemical scents give me migraines. 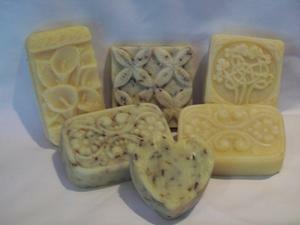 Years ago I started making my own soap, using only natural oils and essentials oils for scents. I use old-fashioned lye and an olive oil base. Is lye dangerous to the user? NO!! The chemical reaction that happens when oils and lye are mixed changes the caustic quality of the lye into a gentle soap. Magic? Why, yes, I think it is!!! My soaps are an olive oil base. I add many other oils and butters to make it super moisturizing. I will keep making my soaps and adding new scents and molds to the ones that everyone loves, so if you don't see something you love, check back and I'll probably have added something new! !